The OSU Student Health Services Pharmacy had a very successful Medication Disposal Day on Thursday, April 21, 2016 under the direction of Candace Haugtvedt, R.Ph., Ph.D. who coordinated the event. We reached 80 people who turned in 131.5 pounds of unused medications! This included 1118 CII tablets or capsules and 370ml of CII liquids that are now off the streets and safely disposed of in an environmentally friendly way. The OSU Police took 11 boxes for destruction by the Environmental Health & Safety Department in Facilities Operations and Development. We handed out two adult Generation Rx educational handouts about how to Take Action to prevent drug misuse at home to each of the 80 people who dropped off unneeded drugs. We had a steady flow of people and collected almost double the amount of drugs as we did the year before and reached almost double the amount of people as well. OSU Police Officer Dave Ferimer, and P3 Pharm.D. 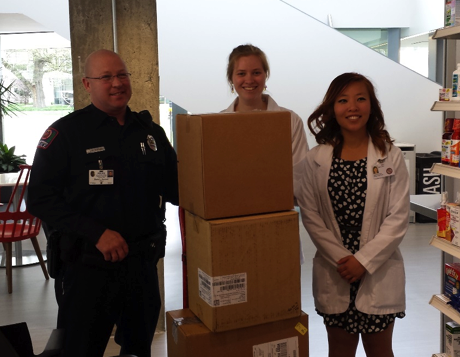 students Andrea Haugtvedt and Lena Wu with boxes of unneeded drugs for destruction at the conclusion of the latest event. Photo courtesy of Candace Haugtvedt. The OSU SHS Pharmacy has been having Drug Take Back Days since 2011. This event was staffed by Generation Rx initiative pharmacy volunteers and coordinated by volunteers from SSHP and student health services. 10TV News even featured a story on our Drug Take Back Day event at noon and 5pm.We will have another Drug Take Back Day here at the OSU Student Health Services Pharmacy on Thursday, October 27, 2016 from 9am to 2pm to coincide with the NOPE (Narcotics Overdose Prevention and Education) Candlelight Vigil in memory of those lost to and those suffering from substance abuse. We are also working on having a permanent Drug Take Back Box installed at the OSU Police Station on campus. A group from the OSU Police Dept., Environmental Health & Safety in Facilities Operations & Development, the Council of Graduate Students and the OSU Student Health Services Pharmacy is working out the policy and procedure details and all of the logistics. There will be an ongoing need for Generation Rx volunteer students to separate out the controlled from non-controlled drugs and provide an inventory for the disposal vendor on a weekly or bi-weekly basis throughout the year. The ongoing costs of drug disposal are also an issue we have to work on finding a funding source for. Hopefully we can work these and other issues out over the next several months to have the permanent Drug Take Back Box in place on campus by next May. Medication disposal days are extremely important to prevent the diversion of unneeded medications and to dispose of them in a safe, legal and environmentally friendly manner. Most teenagers who misuse prescription drugs obtain them from a friend or family member. It is very important to safely store medications, keeping them locked up and out of the reach of children. Safe disposal keeps toxic medications out of the groundwater and protects wildlife from harm. Medication disposal days are key to promoting public health and safety on campus and throughout the community. Candace Haugtvedt is a pharmacist at OSU Student Health Services Pharmacy. 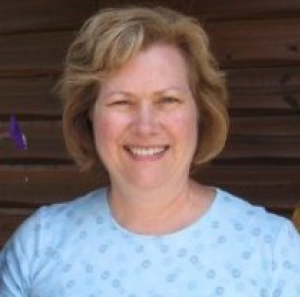 She has a Ph.D. is in Pharmaceutical Administration/Preventive Medicine from Ohio State in 1998. Areas of expertise include health behavior/health promotion, public health advocacy and health care management. Professional experience includes 16 years as a decentralized Hospital Pharmacist at the University of Missouri-Columbia and Mount Carmel Health West in Columbus, and then 19 years as an Ambulatory Care Pharmacist in College Health at the Ohio State University Student Health Services Pharmacy.